You can use the sliders in the web application to price different bonds. 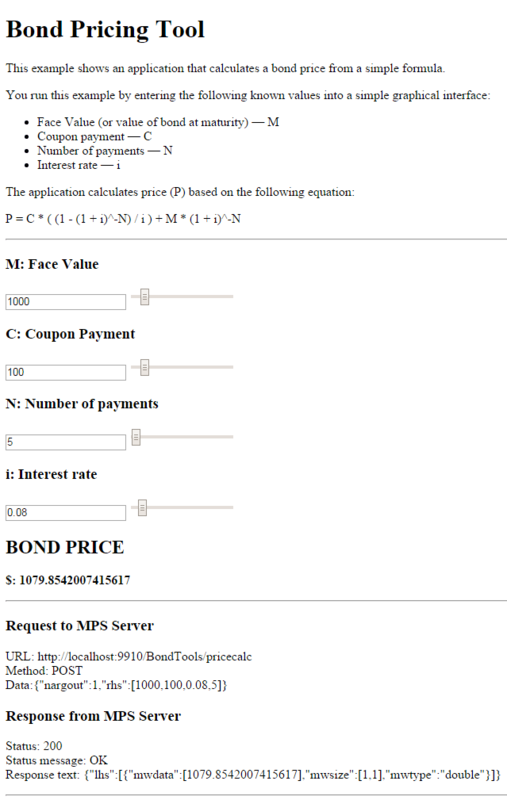 Write the following code in MATLAB to price bonds. Save the code using the filename pricecalc.m. On the Apps tab, select the Production Server Compiler App. In the Application Type list, select Deployable Archive. In the Exported Functions field, add pricecalc.m. Under Archive information, change pricecalc to BondTools. The generated deployable archive, BondTools.ctf is located in the for_redistribution folder of the project. Download the MATLAB Runtime, if needed, at https://www.mathworks.com/products/compiler/mcr. See Download and Install the MATLAB Runtime for more information. Create a server using mps-new. See Create a Server for more information. If you haven't already setup your server environment, see mps-setup for more information. If you have not already done so, specify the location of the MATLAB Runtime to the server by editing the server configuration file, main_config and specifying a path for --mcr-root. See Edit the Configuration File for details. Start the server using mps-start, and verify it is running with mps-status. Copy the BondTools.ctf file to the auto_deploy folder on the server for hosting. Enable Cross-Origin Resource Sharing (CORS) by editing the server configuration file, main_config and specifying the list of domains origins from which requests can be made to the server. For example, setting the cors-allowed-origins option to --cors-allowed-origins * allows requests from any domain to access the server. See cors-allowed-origins and Edit the Configuration File for details. document.getElementById("request").innerHTML = "URL: " + url + "<br>"
//Use MPS RESTful API to retrieve response in "lhs"
document.getElementById("response").innerHTML = "Status: " + request.status + "<br>"
//serves as an entry point into the web page's content. Save this code as an HTML file named bptool.html. You can use the sliders in the tool price different bonds. Varying the interest rate results in the most dramatic change in the price of the bond.